[XPB-72024X] Our Standard Gear Metal Locker with Ventilated Doors is fabricated of 16 gauge steel. The ventilated doors open from left to right and are attached with 3 heavy duty hinges allowing for smooth operation and include a recessed handle and hasp for added security and can accommodate a built-in lock or padlock. Units are 24”W x 72”H x 24”D and feature a 13 ¾”D upper shelf and a 12”W x 12 ½”H x 13 34/”D top compartment with a steel padlock hasp. Also included are 2 steel coat hooks, a coat rod and a 14”H foot locker with hinged lid and recessed padlock hasp for secure storage. 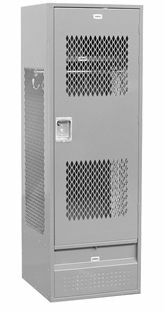 These gear lockers feature a durable powder coated finish available in gray, tan or blue. For shipping quotes, orders or questions please call our Customer Service Center at 1-877-483-9270.